Hodnet’s new medical centre has come in for hearty praise from the parish council. Other councillors agreed that the new centre was a great benefit to the village. A small village near Market Drayton boasts some of the most up-to-date medical facilities in the county. Two surgeries a day, physiotherapy, and minor surgery are just some of the facilities on offer at Hodnet Medical Centre. The £150,000 new centre on Drayton Road brings the village and surround­ing areas within easy reach of a rural service second to none. And there will be celebrations when the centre is officially opened by Viscount Leverhulme on Sunday. For almost two centuries, local surgeries in Hodnet have been held in the doctors’ homes. The two doctors at the practice, Romesh Mehta and Naref Raichura, therefore aim to provide a service of the future with an old-fashioned and homely atmosphere. Whilst the latest computer technology is used, they don’t intend losing touch with their 3,500 patients or making them feel uncomfortable. And sitting in the 17th century thatched cottage which has been restored into the practice’s waiting room, it is easy to forget where you are. Carpeted and with chintz curtains draping the higgledy-piggildy windows, the doctors have succeeded in creating a homely atmosphere. “What is best for my patients is best for me,” said Dr Mehta, a GP in the village for 23 years. The purpose built centre offers a range of other ser­vices, including health screening for women, family planning, a health visitor, and chiropody. The doctors also plan to include stress management counselling and regular visits from a specialist in geriatric medicine in the future. These services should save many patients long journeys to hospitals in Telford and Shrewsbury. 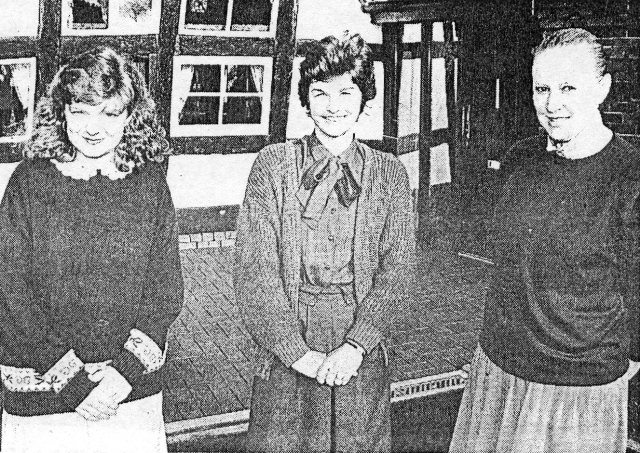 Pictured: Staff at the new medical centre, Miss Lesley Roberts, Mrs Janet Fox, and Mrs Helen Batten. A celebration of old and new took place last weekend with the official opening of Hodnet Medical Centre. Hodnet medical practice has managed to combine the best of the village’s heritage with the most up to d­ate medical facilities m purpose built centre. 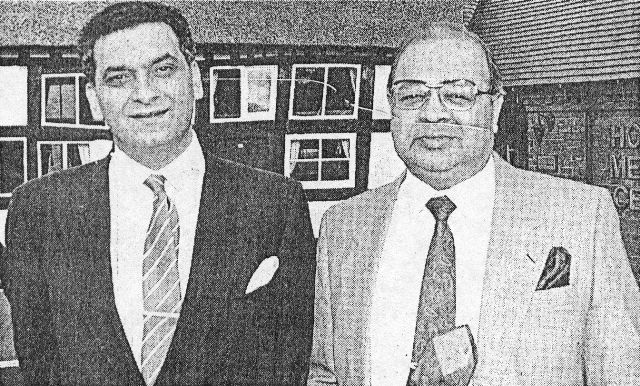 The £150,000 building project saw extensive renovation of a village landmark, a 17th Century thatched roof cottage, to the waiting room of the go-ahead practice, and the erection of a brand new surgery. .
And on Sunday, tribute was paid to the forward thinking of doctors Romesh Mehta and Naref Raichura at the official opening by the Viscount Leverhulme. The practice offers not only surgeries, but chi­ropody, physiotherapy and minor surgery. There are also plans to include stress management counselling and a geriatric medicine specialist. Pictured at the recep­tion at the official opening of the Hodnet Medical Centre are from left: Mr A. Heber-Percy, Dr Romesh Mehta, the Viscount Leverhulme, the Hon Mrs Jane Heber-Percy, and Dr Naref Raichura.